Street performer David Mulder seen here punching a heckler. 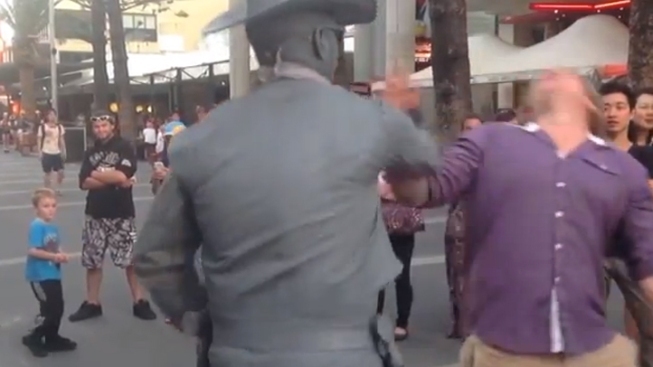 Human statue David Mulder is being investigated after he punched a passerby who taunted him while he was performing at a mall in Australia. Mulder apologized for his actions. But the organization who hired him as a street performer said it will launch an investigation this week. "While I sympathize with the busker, it's clear both parties didn't behave as best they could. Harassment and assault are not welcome in Surfers Paradise,'' Surfer Alliance chair Laura Younger told Australia's News.com. Mulder became an Internet sensation after a mobile phone video was posted on YouTube showing him being poked and prodded by a passerby. He lost his cool when the heckler licked his index finger and stuck it in the performer's ear. The video shows Mulder throwing a punch at the young man, leaving him with a bloody nose. Mulder's wife told News.com that his husband will meet with Alliance officials today to state his case. "He will tell them that this sort of behavior is extremely rare and is not something he'd like to repeat,'' she said, speaking on behalf of her husband. "He's been hassled before but doesn't normally come out swinging - it takes a lot to provoke him." The performer was back at work on Sunday at his usual post at the Cavill Mall. He said he was not proud of his actions. "He was in the wrong, but at the same time I was in the wrong for striking out," Mulder said.